If using classic crust: Heat oven to 425°F. Spray or grease 13 x 9-inch (3-quart) baking dish or 12-inch pizza pan. Unroll dough in pan. Starting at center, press out dough to edge of pan. If using thin crust: Heat oven to 400°F. Spray or grease 15 x 10-inch or larger dark or nonstick cookie sheet. Unroll dough on cookie sheet. Starting at center, press dough into 15 x 10-inch rectangle. In food processor bowl with metal blade or blender, place garlic. Cover; process 10 to 15 seconds or until finely chopped. With food processor or blender running, add 3 tablespoons of the oil through feed tube or opening in top of blender lid. Process 20 to 30 seconds or just until blended. Spread garlic mixture over dough. In 8-inch skillet, heat remaining 1 tablespoon oil over medium-high heat until hot; cook and stir bell peppers in oil 3 to 5 minutes or until crisp-tender. 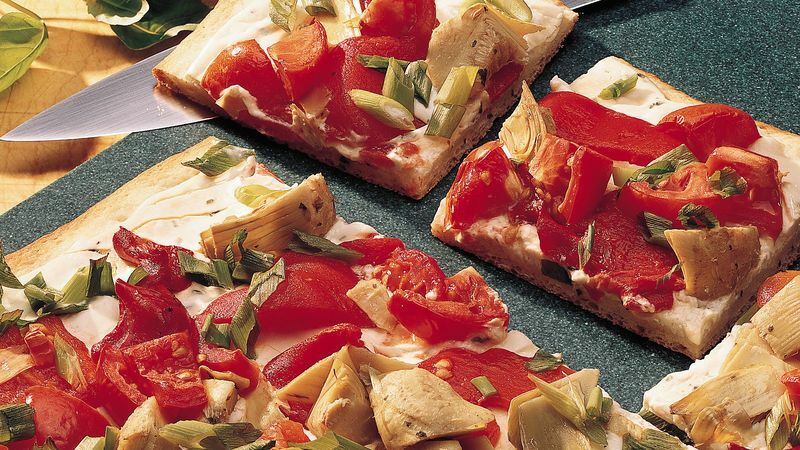 Layer peppers, mushrooms, basil, artichokes and olives over garlic mixture; top with cheeses. Bake classic crust 14 to 18 minutes, thin crust 12 to 15 minutes, or until crust is golden brown around edges and cheese is melted. Cut into 8 servings. Tip if using classic crust: For a crispier crust, prebake crust 8 to 11 minutes or until edges are light golden brown, then add toppings; bake pizza 8 to 14 minutes.